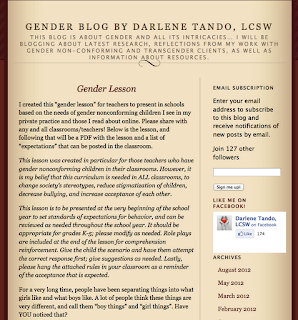 A blog reader shared this Gender Lesson from Darlene Tando's Gender Blog with me, and it's awesome! All toys are for all children. Everyone gets to pick their own style. We stand up for others. I love that last line, "We stand up for others." It's not enough to let people be themselves; we need to stand up for them when others would harm them.